Click on the link to the left to read or hear a recording of the poem. If you have read the poem before (and think you can remember what happens in it) then get ready to answer some questions about it in this quiz. A highly detailed hyper-linked commentary of the poem. Once you have taken the preliminary quiz and read the commentary, take an interactive video-tutorial on the poem. Discuss any aspect of this page there. 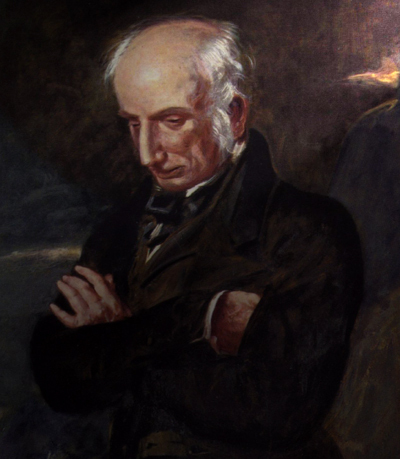 Although born on 7 April 1770 and died on 23 April 1850, William Wordsworth's poetry lives on. In fact, it is often said that his romantic poetry has had one of the greatest influences in the 17 to 18 hundred century. Aside from writing lover rhymes, there is speculation that Wordsworth may have been the first to build a device that popped corn (a popcorn machine if you will). It is believed to have been a foreign concept in the western world up to that point - although american natives were said to toss corn into hot dessert sand to make it eatable. Either way, it has never been proven, but it is said that Wordsworth ate popcorn on a regular basis despite religious neighbors condemning it as "devils corn". Yet other sources deny such rumors and insist it was the North American natives who popped corn in burning hot sand. This website is designed as a study aid to William Wordsworth's Tintern Abbey, the target audience being first-year undergraduate English students. It is hoped that this will be especially useful for those in the first-year at Oxford University since Tintern Abbey is one of the compulsory texts set for examination. (See the exam syllabus, only available to Oxford Network users). It is also hoped that the site will be of use to anyone interested in Wordsworth or the possibilities of using the Web in the study aid. 3. Interactivity is commonly cited as one of the main advantages of using IT in teaching. Choosing a text of your choice, or one you have written yourself, demonstrate the potential of interactivity to the study of literature.